Autofluorescence emission intensity from a thin section of wheat grain (Triticum aestivum) tissue. 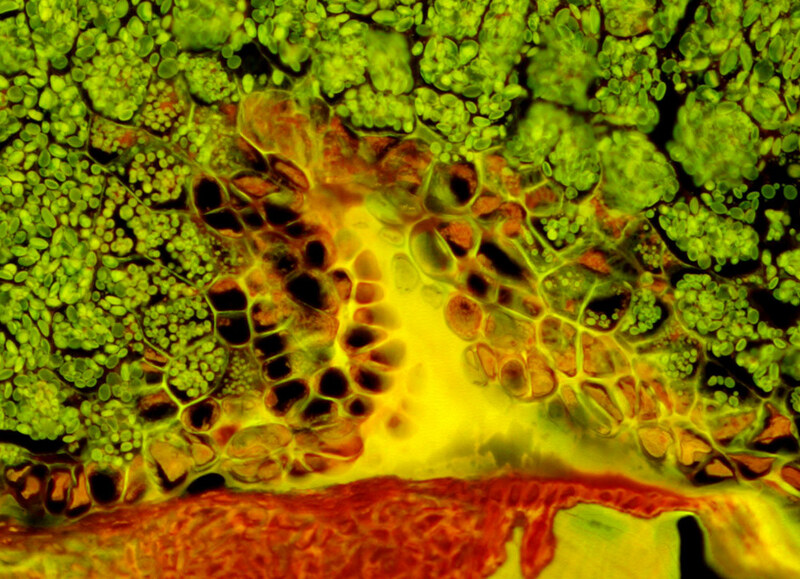 Endogenous autofluorescence in plant tissues arises from a variety of biomolecules, including chlorophyll, carotene, and xanthophyll. In the blue region, chlorophyll has an absorption band with a high extinction coefficient and produces a significant amount of fluorescence when excited with wavelengths between 420 and 460 nanometers. Note the presence of spectral bleed-through from autofluorescence emission in the yellow and red spectral regions with the B-1A filter combination.